Just received my RR kit on Friday and jumped right into the build. I do have a couple of questions that I'm not 100% on as they are not in the instructions. Also I haven't figured out the search function here in cb500x.com, wanted to just search within the RR Vendor section. 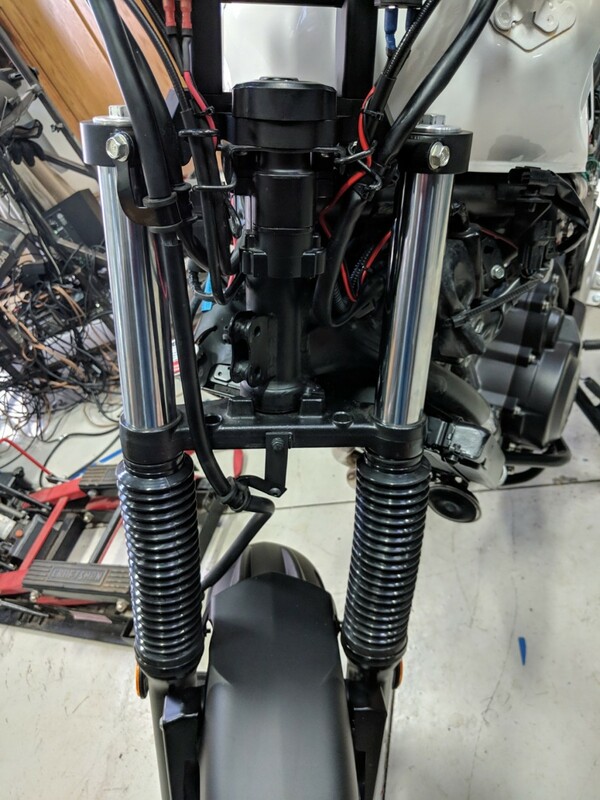 First question, looks like Tractive changed the design a little, just wanted to make sure I installed the shock correctly, pretty much the only way it would go in with the hose facing rearward. Second question is on attaching the front disc, haven't found any instructions anywhere but there seems to be two sets of washers and a set of nuts that you use with the original bots. Do you use the thin washers between the disc and the wheel mount? And then the second washer on the back side next to the nut? Oh, also note my bike is non-ABS. Oh, also the tip on the latest video of driving a torx into the security bolts works pretty slick, use a T45 torx and give it a couple of good wacks to seat it. Mine was a 2016 build, non-ABS - just FYI since RR continue to evolve their offering. 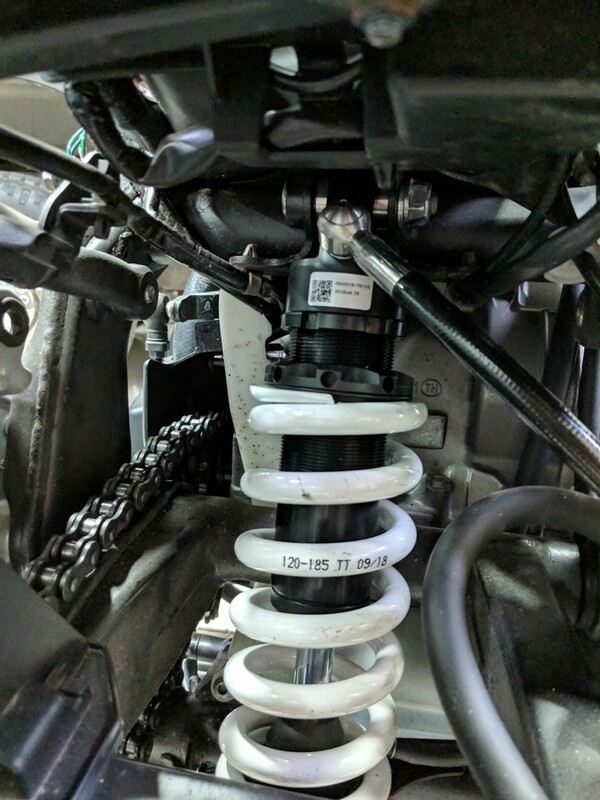 Anyway I think it is a function of the way the shock is built at the factory. My feed is at 2 o'clock relative to yours at 6 o'clock. As long is there is ample clearance with the rear wheel I don't think it matters. FWIW I used an R&G Sports Shock Tube to protect it from road crud. See here https://www.twistedthrottle.com/r-g-shocktube-9-x-9-single?gloc=1&gclid=Cj0KCQiAi57gBRDqARIsABhDSMo8xW2QuN3V0dTj90kCZcLaICj95vfSbVa73r66Bk0qHRP0v7lVS10aApvxEALw_wcB. There are other vendors. I just pulled the cover off to do a 12,000 mile check up and the shock was pristine. Worth the $35 to protect a $1,000 + investment IMHO. 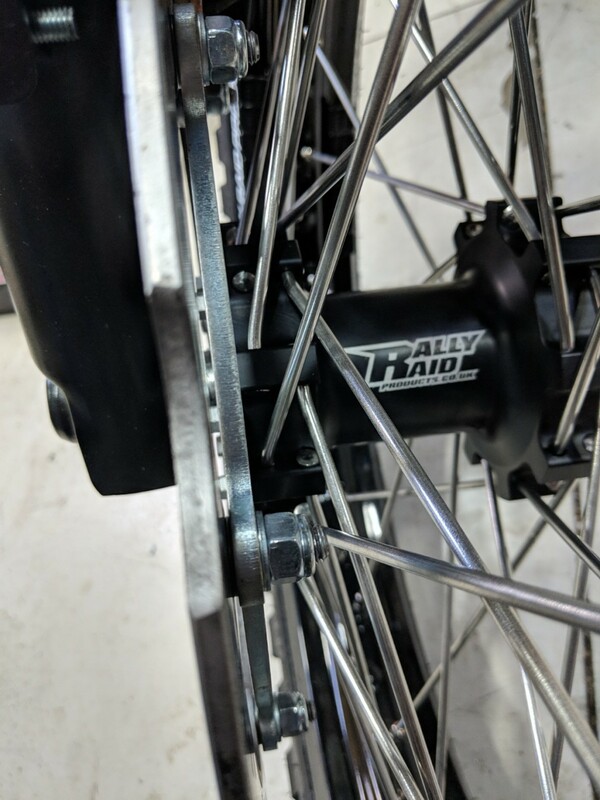 Re: the brake disc, mine has a fat/normal washer on the backside and no washer between the bolt head and the outside face of the disc (that I can see and the bolt looks flush to the disc). On mine the clearance between the bolt head and the front caliper is relatively tight (a few MM). Ms. Morgan I am certain will add her expertise in responding to you. Thanks T2, that is what I have seen also as they continue to revise the kit, reviewing the last build video it looked like they had the same shock as I had, just with the remote adjuster. I did send an email to RR also on the brake disc, not sure what the other set of washers were for then. ... as they are not in the instructions. I love RR products, but their instructions leave much to be desired. Luckily there are a lot of helpful folks about. Hi Pmason0 - as you've surmised, the shock really can only go one way round, the current instructions are a hang-over from when the hose boss used to be at the 2 o'clock position. 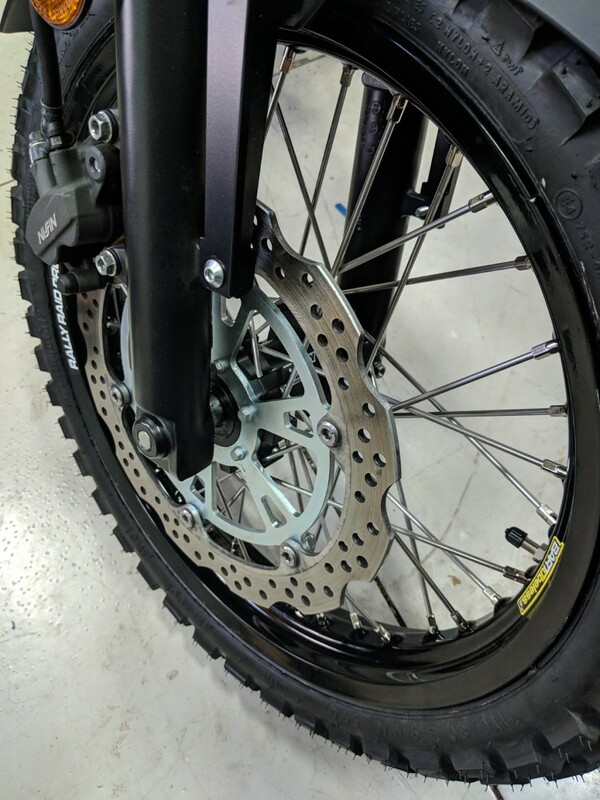 As for the front brake disc mount - the order is as follows: thin washers go under the head of the OEM disc bolts, then the disc, direct onto the spider, then the thicker washer and finally the acorn nut. 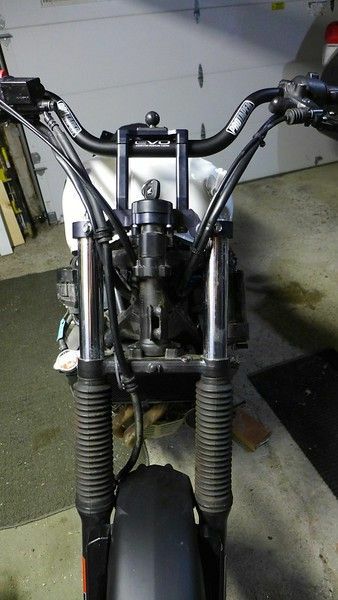 The other thing I think is still missing/to be revised on the LEVEL 2 fitting instructions is to remove and discard the front brake hose clamp to the lower triple-clamp, and just use a zip-tie through the recessed hole on the right hand side to loosely keep the hose in line. You would also benefit from removing and discarding the metal cable guides on either side of the ignition barrel (basically just leave them off when you swap the OEM triple for the billet one) and use zip-ties to keep the cables neatly together, as this frees up a little extra length when you're using the taller fat-bars. Jenny, Thanks for the input, I'm not sure the washer would go over the bolt there, but I need to take one out and see. As you can see from the picture right now I have it between the disc and the spider mount. Initially I did just tie-wrap brake line, but now I created a simple bracket. Oh, any recommendations on fork pre-load adjusters? Turns out that the RR kit no longer comes with them as the 2016+ years have them, but my 2014 doesn't. I did try and order some OEM adjusters but it just came back as back ordered, I do see some on eBay and Amazon, wasn't sure about the quality of them. T2, I did add the R&G Sports Shock Tube protector on the rear, thanks. Lookin good. I love spoked wheels. Hi pmason0 - do swap the the thin washers over - the disc is designed to sit flush against the spider, the thin washers under the head of the OEM disc bolts - the I/D of the thin washers is specced so it fits over the shanked part of the OEM disc bolts. As for preload caps, the OEM ones fitted to the 2016-on bikes are not appreciably better than those you see on ebay/Amazon etc. although less gaudy than some of the colour combos you see coming out of China - pick some plain silver ones online and you'd probably be hard-pressed to see any difference to be honest. The problem with both the OEM and 3rd party adjusters is they use a single [flat blade screwdriver] slot to adjust the preload, and since the threaded portion acts directly on the spring inside, you can find the slots getting marked damaged with the force required to turn the bolt, plus there is a danger [if not tendency] for those preload adjusters to back out over time, so might need re-adjusting. for info. 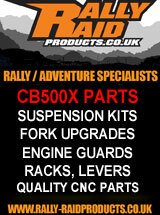 This is why the original Rally-Raid adjusters came with a hex bolt and locking nut (and bleeder screws/valves). Currently there is no plan to reintroduce the original design caps since as the years go by, there is less and less demand for them - however, one thing John is considering is to make a version of the flush-fitting design they have for the G310GS, and make those available for those who want a more precision [indented] preload adjuster - that also looks really smart. Fortunately for fork preload, once you've got the sag set the way you like it, you can pretty much forget about it - while in comparison you're more likely to want to adjust the rear shock preload more frequently if and when you carry significantly varying loads [passenger/lots of luggage] for example - so generally speaking the 2016-on style caps (or aftermarket equivalent) appear to do that job well enough. ps. do keep an eye on that hose bracket extension you've made, as if it is appreciably deeper than the OEM one was, there is a danger the mudguard could hit it on full compression. Thanks, tomorrow I will swap the washers around on the discs. Yes I did think about the clearance on the brake line bracket, I purposely bent it backwards thinking if it did come in contact it would bend it up further. Wrapped up the cb500x RR today. Thanks everyone for the help. It definitely changed the stance, I'm on my tippy-toes now. Now just have to wait until it warms up, hopefully not until March/April.